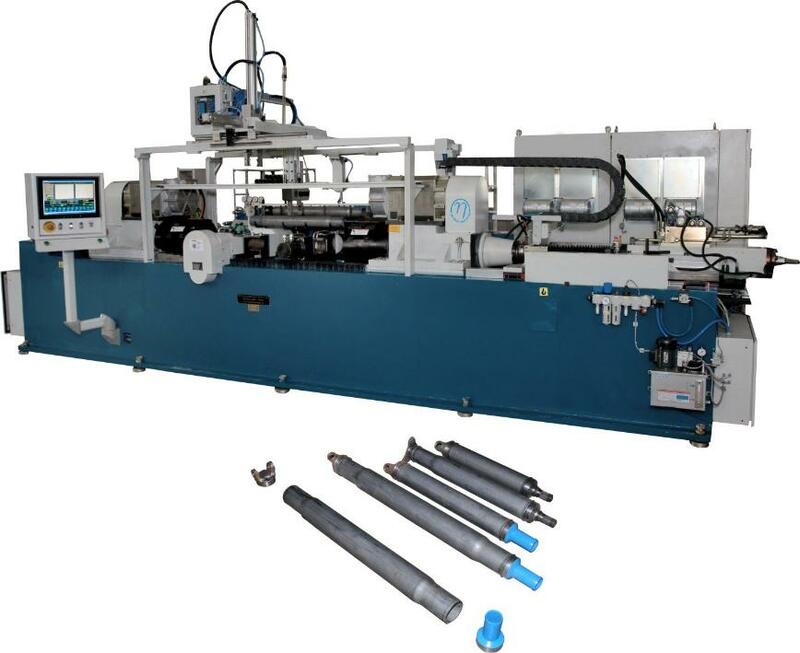 This 15 ton dual sliding head machine is designed for welding end pieces on tubes/pipes to make propeller shafts. End pieces are welded simultaneously with precise orientation, which reduces welding time drastically. The machine consists of a steel fabricated frame on which the LH and RH spindle heads moves on LM guides, by servo hydraulic cylinders. The piston rod of servo hydraulic cylinder which is rigidly mounted on the frame at the left is connected to the left spindle head slide. Another servo hydraulic cylinder at the right is mounted on a slide unit, which can be moved by a pneumatic cylinder. This arrangement helps in accommodating component length variants. The self-centering vices, one fixed and another adjustable are mounted in between LH and RH spindle heads.The machine is equipped with mechanisms for auto loading of non-rotating component (tubes) and unloading of welded components. The machine has a PLC based control system with an industrial PC and software capturing real time weld data. Application: Enables welding at both ends of propeller shafts simultaneously to join end pieces to tube with precise orientation.